Puerto Princesa, officially the City of Puerto Princesa, (Cuyonon: Siyudad i'ang Puerto Princesa; Tagalog: Lungsod ng Puerto Princesa; Spanish: Ciudad de Puerto Princesa), and often referred to as Puerto Princesa City, is a 1st class Highly Urbanized City in the Philippines. According to the 2015 census, it has a population of 255,116 people. It is a city located in the western province of Palawan, and westernmost city in the Philippines. Though the seat of government and capital for the province, the city itself is one of 38 independent cities within the Philippines not controlled by the province in which it is geographically located and is therefore an independent area located within Palawan. It is the least densely populated city in the Philippines. In terms of land area, the city is the second largest geographically after Davao City with an area of 2,381.02 square kilometres (919.32 sq mi). Puerto Princesa is the location of the Philippines' Western Command headquarters. Today, Puerto Princesa is a tourist city with many beach resorts and seafood restaurants. It has been acclaimed several times as the cleanest and greenest city in the Philippines. During WWII and the Japanese occupation, the village was largely abandoned. The Filipino Constabulary barracks was the scene of the Palawan Massacre, just before liberation with the allied Invasion of Palawan. The town was converted into a city on 1 January 1970 under Republic Act 5906 as amended by P.D. 437, through the effort of then Congressman Ramon Mitra, Jr. Feliberto R. Oliveros, Jr., who then became the first City Mayor. Puerto Princesa is known as the "Eco-Tourism Center of the Philippines". In recent years, the city has seen an increase in the number of tourists bringing with them trade and businesses for the city. Many hotels ranging from basic to five-star luxury accommodations have been developed since the 1990s to cater to a growing number of foreign and local tourists in the city. There are also a number of restaurants, bars and shopping malls, including the Robinsons Place Palawan, NCCC Mall Palawan, Unitop Mall Puerto Princesa, as well as the recently opened SM City Puerto Princesa. Some tourists who come to Puerto Princesa visit the Puerto Princesa Subterranean River National Park, one of the New7Wonders of Nature, located 50 km north of the city. The city is also the jump-off point for exploring the Tubbataha Reef. The Puerto Princesa International Airport is within the city proper. Puerto Princesa is accessible by direct flights to and from the major cities of the Philippines, such as Manila, Cebu, Davao, Iloilo & Clark, as well as other parts of Palawan, such as Cuyo, Busuanga, San Vicente and El Nido. Puerto Princesa then Mayor Edward S. Hagedorn unveiled the environment-friendly and economical electric-powered “Trikebayan” (which does not emit any noise or carbon monoxide) at the Kapihan sa Sulo forum, Sulo Hotel, Quezon City. The Trikebayan costs only ₱48 or $1.20 per day to operate, while a gasoline-powered tricycle operation would cost ₱200. Rolly Concepcion, who conceptualized the Trikebayan, said that converting a tricycle engine to electric costs ₱68,000. The rechargeable battery under the passenger seat can run for 12 hours. Mr. Conception died before the project was completed. Although Puerto Princesa has this bold plan for electric vehicles, the municipal government and tourist office has stated (when asked by a tourist in August 2011),[better source needed] that it has no published or announced plan for providing for the current and future needs and safety of pedestrians or bicycle riders. Spaces for walking and bicycling from one place to another are not being considered. ^ a b Ladaga, Rica Thea (11 April 2018). "A Glimpse of Palawan: The Impact of Community-Based Ecotourism | DSWD Field Office IV Mimaropa Official Website". DSWD Field Office IV Mimaropa Official Website. Archived from the original on 13 February 2019. Retrieved 13 February 2019. ^ a b Santos, Catherine (9 May 2017). "Legislator tags Puerto Princesa as "City in the Dark"". Palawan News. Archived from the original on 20 February 2018. Retrieved 13 February 2019. ^ "Province: Palawan". PSGC Interactive. Quezon City, Philippines: Philippine Statistics Authority. Retrieved 12 November 2016. ^ a b c d Census of Population (2015). "Region IV-B (Mimaropa)". Total Population by Province, City, Municipality and Barangay. PSA. Retrieved 20 June 2016. ^ "List of Cities". Philippine Statistics Authority – National Statistical Coordination Board. Archived from the original on 20 February 2016. Retrieved 5 February 2019. ^ Graceffo, Antonio (9 Jun 2007). "Puerto Princesa: The Philippines' Cleanest and Greenest City". Wild Asia. Archived from the original on 4 January 2013. Retrieved 13 February 2019. ^ Wilbanks, Bob (2004). Last Man Out. Jefferson: McFarland & Company, Inc., Publishers. pp. 45, 101. ISBN 9780786418220. ^ "Republic Act No. 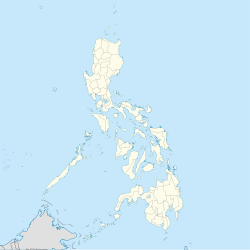 615; An Act Creating The Municipality Of Roxas, Province Of Palawan'". PhilippineLaw.info. Archived from the original on 31 May 2012. Retrieved 13 February 2019. ^ "R.A. No. 1234, An Act Creating the Barrio of Manalo, Municipality of Puerto Princesa, Province of Palawan". LawPH.com. Archived from the original on 15 August 2012. Retrieved 2011-04-11. ^ "R.A. No. 1527, An Act Constituting the Sitios of Calagbenguen, Tarabanan, Bendoyan, Talabigan, Tagbuan and Langogan, Municipality of Puerto Princesa, Province of Palawan, into a Barrio to Be Known As Concepcion". LawPH.com. Archived from the original on 1 June 2012. Retrieved 2011-04-12. ^ "R.A. No. 2024, An Act Changing the Name of Barrio Tapul, Municipality of Puerto Princesa, Province of Palawan, to Barrio Salvacion". LawPH.com. Archived from the original on 31 May 2012. Retrieved 2011-04-13. ^ "R.A. No. 5906: An Act Creating the City of Puerto Princesa". The Corpus Juris. 21 June 1969. Archived from the original on 13 February 2019. Retrieved 13 February 2019. ^ "Presidential Decree No. 437, s. 1974". Official Gazette of the Republic of the Philippines. Archived from the original on 13 February 2019. Retrieved 13 February 2019. ^ "Filipino rebel group claim kidnappings". BBC News. 28 May 2001. Retrieved 27 November 2012. ^ Municipality/City: PUERTO PRINCESA CITY (Capital), National Statistical Coordination Board. ^ "Puerto Princesa, Palawan Climatological Normal Values". Philippine Atmospheric, Geophysical and Astronomical Services Administration. Archived from the original on 10 October 2018. Retrieved 10 October 2018. ^ "Puerto Princesa, Palawan Climatological Extremes". Philippine Atmospheric, Geophysical and Astronomical Services Administration. Archived from the original on 10 October 2018. Retrieved 10 October 2018. 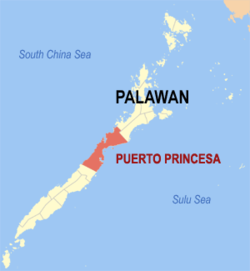 ^ "Province of Palawan". Municipality Population Data. Local Water Utilities Administration Research Division. Retrieved 17 December 2016. ^ "PP Underground River". New7Wonders of Nature. 23 September 2016. Archived from the original on 5 February 2019. Retrieved 13 February 2019. ^ Campo, Liv G. (6 May 2008). "Hagedorn urges use of electric tricycles". The Philippine Star. Retrieved 13 February 2019. ^ Andrade, Jeannette (20 January 2008). "Finally, a tricycle we could all love". Philippine Daily Inquirer. Archived from the original on 20 January 2008. Retrieved 13 February 2019. ^ "QC eyes sister city ties with Naga City". Manila Standard. 17 February 2017. Archived from the original on 13 February 2019. Retrieved 13 February 2019. To date, Quezon City has sister-city ties with 11 other Philippine cities and municipalities—Sadangga in Mountain Province; General Santos City; Pura, Tarlac; Davao City; Iloilo City; Wao, Lanao del Sur; Cotabato City; La Trinidad, Benguet; Puerto Princesa; Banay-Banay, Davao Oriental; and Alicia, Isabela. ^ Jabagat, Orlan C. (29 November 2018). "Tagalog News: Puerto Princesa, Haikou City ng Tsina, sister cities na" (in Tagalog). Philippine Information Agency. Archived from the original on 13 February 2019. Retrieved 13 February 2019. ^ "Sister Cities | Maui County, HI - Official Website". Mauicounty.gov. Archived from the original on 25 October 2018. Retrieved 13 February 2019. Wikimedia Commons has media related to Puerto Princesa City. This page was last edited on 22 April 2019, at 00:45 (UTC).